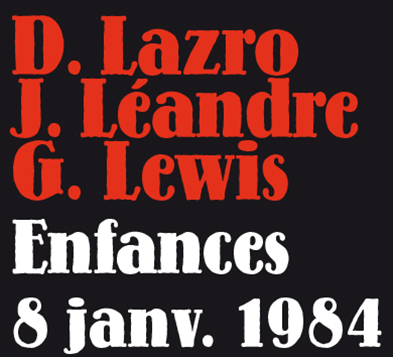 Amazing to think that 30 years of Joëlle Léandre’s many collaborations with Daunik Lazro and George Lewis began with a recording we’ve never heard in full before now. As I’ve been soaking in all the writing this week, I revisited a couple of seminal albums also recorded in the 1980s, particularly the Intakt releases The Storming of the Winter Palace (the epic quintet featuring Léandre, Lewis, Maggie Nicols, Irène Schweizer, and Günter Sommer) and Paris Quartet (Léandre’s album with Lazro, Schweizer, and Yves Robert). A portion of this trio performance appeared on Lazro’s HatHut set, Sweet Zee, but if I’m not mistaken, this is the first release of the complete session. Thinking about how this is likely the first recorded meeting of these three, the clarity of the recording would be enough to recommend it, for its historical value. But the real prizes here are the vibrancy and ingenuity of three great improvisers in collaboration. The opening 30 seconds of “Enface 1” contain a scattering of percussive noises (think Art Ensemble of Chicago-style little instruments), Léandre’s voice, and the briefest tease of Lazro’s sax. A minute later, the trio is fully awoken. 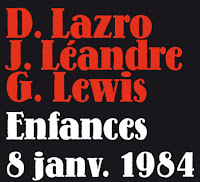 Lazro and Léandre have long been collaborating, and the genesis of their partnership illuminates how well matched they’ve been since the beginning. All three musicians boast tremendous talent and commitment to the moment, but there’s also sly humor and a passionate drive to urge listeners to out of their traditionally passive role. “Enfance 4” is a wonderful examples of this, with Léandre’s arco solo suddenly interrupted by Lewis and Lazro’s riffs and squaks. “Enface 5” is something of preview of the past 30 years in retrospect. Early on, Lazro takes a lyrical solo, which Léandre quickly picks up on bass. The two continue moving forward, somewhat hesitantly, before ceding the floor to Lewis for an extended solo. The three come together in a swirling passage of singing, bass, trombone, and sax, which contrasts staccato passages with brassy outbursts. Hearing it all hang together in synchrony, I was somewhat on edge, waiting to hear how long the passage would sustain itself. With most of the tracks clocking in at sub-4 minutes, the 20-minute “Enface 5” and 12-minute “Enface 6” form the centerpiece of the album. Toward the middle of “Enface 6” is a Lazro/Lewis duet, with the two weaving their lines together into a dense run. Gradually, Léandre joins, then quickly takes centerstage for a solo that sets the path forward for the piece’s conclusion. The final track, “Enface 10,” plays like a strident plea that could be a call for peace, a call to action, or a call simply echoing out into space, perhaps never to be answered.